The theme of this post is easily generalised to other use cases and serves as an example of how blockchain technology can shift power and trust in a well-established system, in this case the one of health care. Medical prescriptions should be unified and digitalised. They should be resilient and controlled by the real owner of the prescription (and thus of the personal data). This can be achieved by a blockchain-based solution. A system of smart contracts in Solidity is proposed which achieves this and furthermore is modular and update-able. Some general advice on designing a blockchain solution is given. from the Greek word for physician (iatros). Add an illness to that and you have an illness caused by a physician. Now, it sounds like an oxymoron, but it is in fact more common than we would of course like to be. You can divide the causes for iatrogenic illness into so-called Adverse Drug Events (ADE) and, to be completely MECE*, other reasons. Other reasons would include things such as rough examinations, surgical errors (there's a reason they draw arrows on the limb to be amputated) and so on. ADE includes all injuries or complications caused be medication, be it the wrong medication, drugs interacting in unintended ways and so on. ADE has shown to be the most common cause of injury to hospitalised patients, and furthermore, the most preventable one. Where is the problem coming from? Knowledge deficiencies - among doctors, patients or pharmacist about drugs, other parties, et c.
These errors all illustrate why prescribing errors are so common, but also why they should, to a large extent, be avoidable. The thing is that, considering the current rate of prescribing errors causing damage or danger to patients being relatively low (ca. 2% ), its importance is overshadowed by more clinical research in medicine and is thus being overlooked by the research community and public in general. One reason for this could be the wide-ranging competencies required to implement a system for decreasing the rate of prescribing errors to zero. To do such a thing, one would require technical expertise within security and privacy as well as all the various skills for application development, one would also require medical and pharmacological knowledge, and essentially, one would need to have experience within information systems management. To resolve this error, data regarding patients and their medications needs to be unified, available and guaranteed correct. There shouldn't be multiple versions with equal or uncertain amounts of validity. Additionally, there should be little chance of the data getting lost or not available when it is needed. It is completely human and expectable that a patient taking many different medication can't remember the details of complicated names of each substance. This can be solved, however, by the unification of medication plans and assurance that all prescriptions are correct and active. Through the unification of the various systems available currently, the process of transferring prescriptions would be simplified. Through the digitalisation and implementation of a permissions management system patients would only need some type of identification (could be biometric) to collect their medication. Assuming the doctor enters the prescription into a digital system and doesn't write with pen and paper, this problem is practically eliminated. Again, through the unification of the different possibilities to prescribe a medication, there would be no such things as the wrong type of document. At least not inside the system. Who needs to participate in the network? In this case, the only users are doctors, patients and pharmacies. So to not take on additional risk regarding data exposure, only those who are on-boarded and verified through some separate process should be allowed to participate in the network. There are however some negative aspects of choosing a private or permissioned blockchain, one point being that there might not be enough active nodes to keep the consensus building at an acceptable fault-tolerance level at all times. This can be solve by some type of incentive or requirement that for example doctors keep a running node at all times. Another risk of running a private blockchain is that, when the amount of nodes isn't very large, and the users consists of a specific group of people (such as doctors in Germany), then the risk of collusion becomes considerable. To combat this, the consensus-making should be well-spread geographically and demographically. What data and functions need to be on the blockchain and what should definitely not be there? In the case of a medication plan, the data which is required to be on the blockchain consists of three parts; user IDs, prescriptions and doctor/pharmacy permissions to prescribe/sell medications. Naturally, we can't have plaintext information about patients and their prescriptions, even if it is a private network. Therefore, IDs are formed from a public/private key-pair (similar to bitcoin or ethereum), which should be generated by the user, on a user device. Prescriptions are only ever published on the blockchain as hashes, because even though the users theoretically are anonymous, it has been shown that Bitcoin transactions can be traced back to a person. 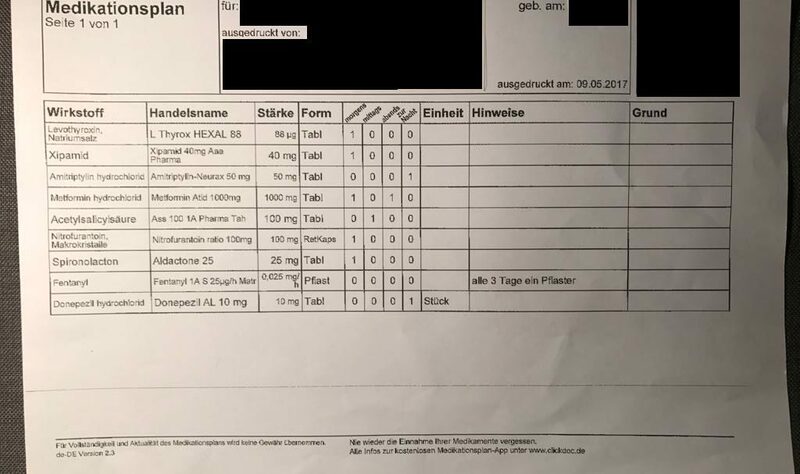 The permissions of doctors and pharmacies also need to be stored on the blockchain, in a smart contract to ensure that they aren't manipulated or somehow overruled. Including permissions and sensitive data in smart contract means that extreme caution needs to be taken when programming them, to ensure that no syntactic or logical mistakes are made. The functionality needed on the blockchain is basically complimentary to the data pieces, getters and setters. But additionally, permissions needs to be handled on-chain. How should the smart contracts be written? There are relatively few resources by experienced smart contracts developers on best practices for building smart contracts, but mostly the general advice for writing good code (failing loudly and as early as possible, commenting, etc.) should be followed. There is however, so much to say about specific smart contract programming that it will be more explained in another blog post. Here, I'll just talk about architecture of the system of smart contracts briefly. In order to be able to keep an overview of the smart contracts and functionality used in the application, they should be as small and simple as possible, thus facilitating analysis. Ok, so say that you have a fairly complicated (not in a computational way) functionality to begin with, then you separate it into multiple smart contracts and end up with maybe five to ten of them. How are you supposed to keep track of them and increase the modularity of you system? Enter the contract managing contract. It is basically a contract to keep track of (and manage) the different contracts in your system, it logs the addresses and names of each separate contract and provides another contract, the endpoint of the user-facing application, with the possibility to access them. Designing an application for managing sensitive personal information needs to be resistant to failure, privacy-preserving and provide accountability so that any changes to the information can be traced. A very relevant use case for such an application is a medication plan. A suitable system for building the application back-end, is a blockchain-based system of smart contracts. Smart contracts programming is a fairly new phenomenon and is based on decentralisation, therefore much thought should be given to how such a system should be designed. A possible solution was drafted above. 1. Tierney LM. Iatrogenic Illness. Western Journal of Medicine. 1989;151(5):536-541. 6. Monax - Solidity tutorials, https://monax.io/docs/solidity/solidity_1_the_five_types_model/, Accessed on 15/05/2017.